Police in Texas are trying to identify the suspect who dropped a rock onto a moving car, killing one woman inside. 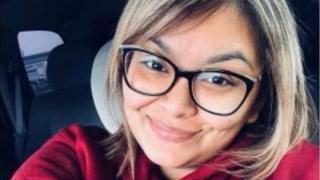 Keila Ruby Flores, 33, died on Saturday after a "large rock" was thrown from an overhead railway track and crashed through her windscreen, police say. Her boyfriend and their three children were all in the car when the incident occurred but were unharmed. On Sunday, the Flores family and the Temple Police Department appealed for the suspect to come forward. "All of sudden something just strikes the window," her boyfriend, Christopher Rodriguez, told KWTX-TV. "An explosion just comes right through the window. I didn't know what it was. I look over and I see Keila and she is laying there unresponsive. "I'm just shaking her, trying to wake her up, [but] she was unresponsive." A post-mortem examination has been ordered. Police have not released any information about the suspect.